Have a special occasion? Our Deli Staff can take care of it for you. Meat and cheese trays, veggie and fruit trays, Bar-B-Q pork or beef, and a full line of delicious salads. Have a hunger attack? 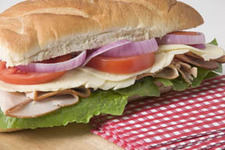 Stop in and we can make you a delicious Sub Sandwich on the spot.